By Bro. Wilbroad Kapembwa, O.M.I. Brother Wilbroad Kapembwa, O.M.I. 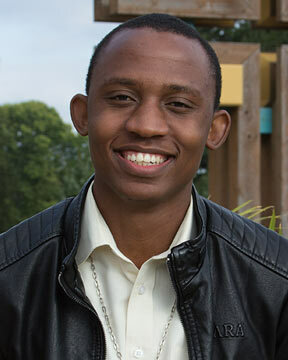 is currently an Oblate seminarian studying at St. Joseph Institute in Cedar, South Africa. Originally from Zambia, Bro. Willboard spent last year discerning his calling at the Oblates’ novitiate in Godfrey, Illinois. While at the novitiate, Bro. Wilbroad wrote this mock trial examining how we are guilty of destroying our natural resources. Your Honor, I, Wilbroad Kapembwa shamefully plead guilty, guilty as charged. In my world of fantasy last night, I was in the reality of life, in the court of justice, standing in the dock feeling guilt and shame. I stood facing Mother Earth as she looked me right in the eyes, hers pouring with tears of pain and anguish. Mother Earth stood before the Judge, the Lordship whose name I was told is God, like an African woman in pursuit of justice. She checked her wrap ensuring it was well adjusted around her.